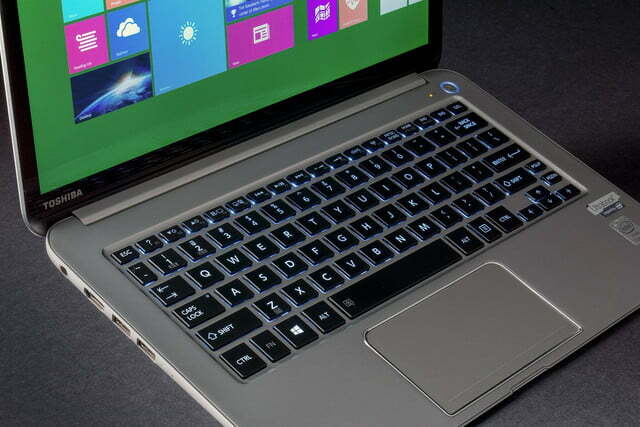 The Kirabook’s modest revision includes a faster processor and a smaller price tag. 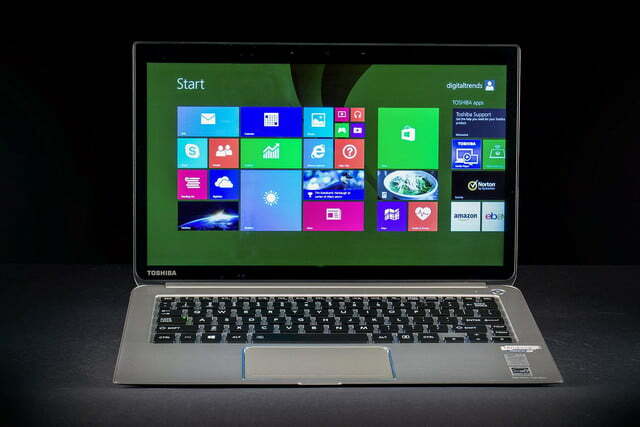 Unfortunately for Toshiba, the competition has improved, too. 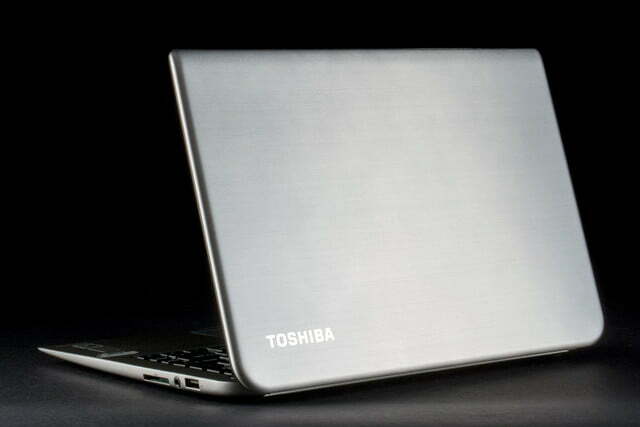 When Apple let loose the first barrage in the resolution wars with its Retina MacBook Pros, it was met with return fire from a surprising competitor; Toshiba. While the company has been in the notebook market for years, its name is still often lumped with “others” when agencies like IDC and Gartner release their quarterly sales estimates, making it easy to forget the innovations Toshiba has introduced over the years. If you buy a Kirabook, be sure not to tell anyone what you paid for it. 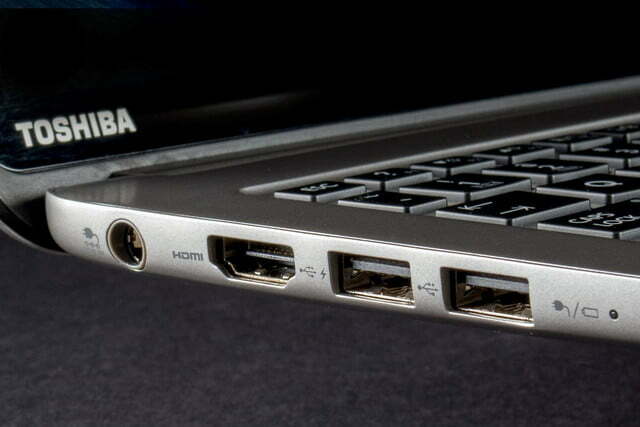 Yet, in a way, Apple’s release of Retina on the Mac played into Toshiba’s hands. The company, which also makes a wide range of televisions, has plenty of experience in the construction of LCD displays. No time was wasted to seize the opportunity and, in May of 2013, the Kirabook was released with a display resolution of 2560×1440, making Toshiba the first company to release a Windows notebook that competes with the Retina’s pixel count. There was a problem, however; the original Kirabook wasn’t a very good notebook. In our review, we found that the system ran excessively hot under load and, display aside, it was average or below-average by every other metric, which made its astounding as-tested price of $2,000 impossible to justify. Now, Toshiba has taken a second shot at the Kirabook by updating it with a 4th-gen Intel Core processor and slashing the base MSRP to $1,499. Our review unit, which sells for $1,699, boasts an Intel Core i7-4500U CPU, 8GB of RAM, a 256GB SSD and, of course, a 2560×1440 touchscreen. But can this new, more powerful, less expensive model fix all its predecessor’s flaws? If you buy a Kirabook, be sure not to tell anyone what you paid for it. Revealing that information might result in some condescending remarks getting directed your way. 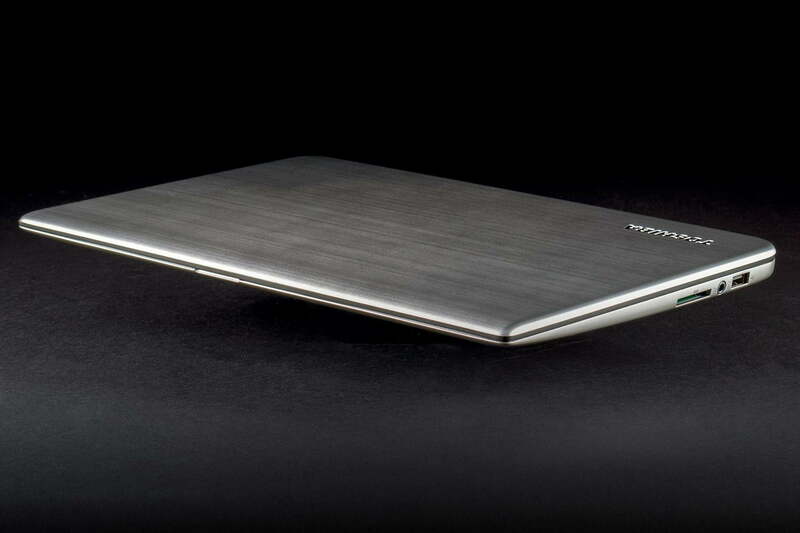 The Toshiba Kirabook looks generic in every way possible, from its thin, tapered profile to its silver, metallic finish. At the time of its original release in 2013, the chassis, which is only seven tenths of an inch thick, looked surprisingly thin, but a year has passed and competitors have caught up. That’s not to say the system is cheaply built, however. Chassis flex is well controlled, the thin-bezel display looks expensive, and panel gaps, though visible, are as tight as they should be. 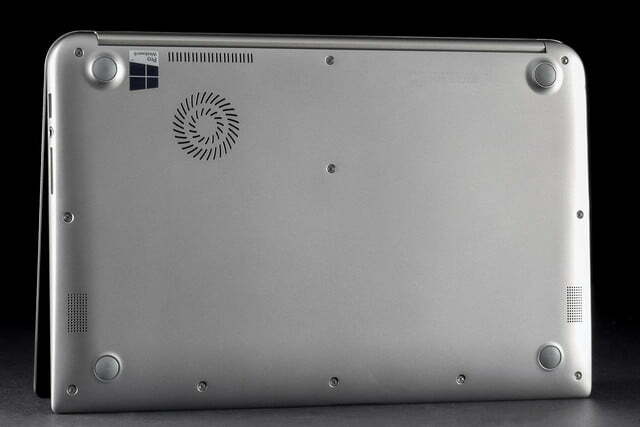 Still, as with its appearance, there’s nothing about the Kirabook’s construction that’s remarkable, beautiful or unique. There is one exception though; connectivity. Three USB ports, all 3.0, are standard, along with HDMI-out, a combo headphone/microphone jack and an SD card reader. Better still, these ports are located away from where a right-handed person would use an external mouse, though left-handed owners will find some USB ports in the way. 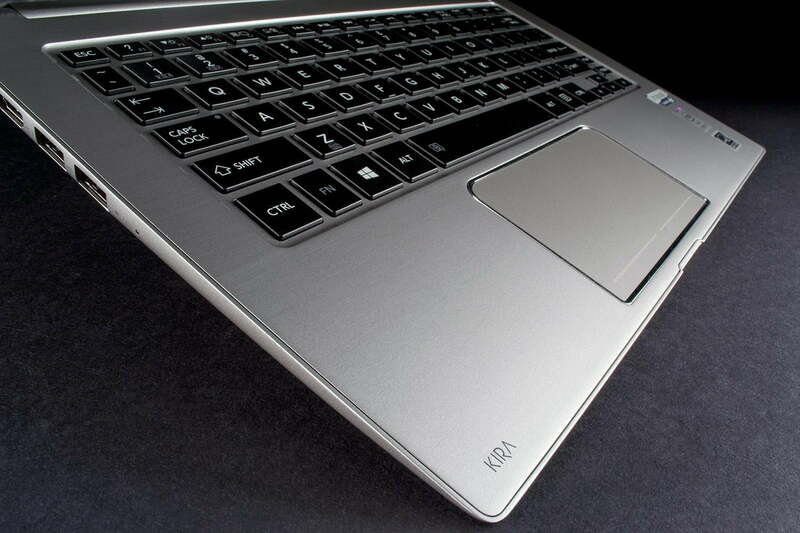 The Kirabook’s inability to compete with the elegance of similarly priced competitors extends to the keyboard, which is “fine,” in the same way your significant other would be “fine” with you canceling a romantic dinner to attend a basketball game. In other words, it’s a grudging compromise; key feel is alright, but the layout is narrower than it has to be and numerous keys, from the function row to Caps Lock, are truncated. The result is a typing experience that’s not as pleasurable it should be. Backlighting is included but, again, there are flaws. There’s just one brightness setting, and it’s a bit too bright for comfortable use in a completely dark room. Uneven light leak is a problem, too; several LEDs have a virtually unobstructed path to the user, which can be distracting. 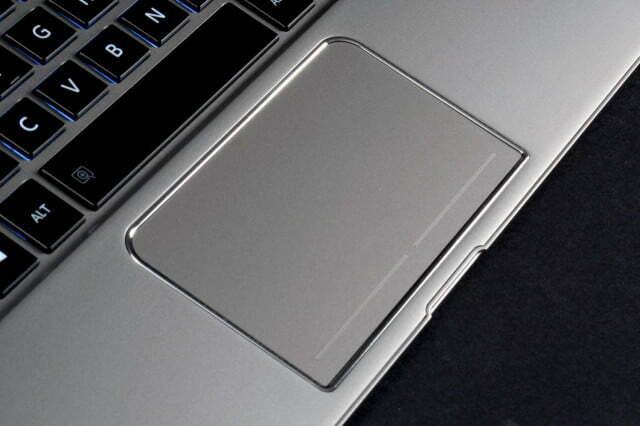 Touchpad quality is better, though not exactly a highlight. 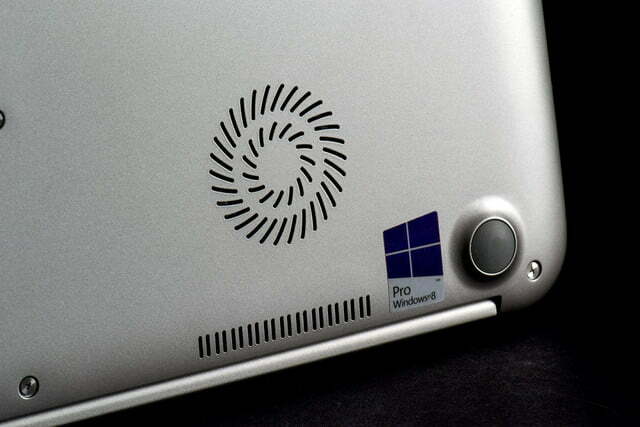 The surface, which is almost five inches wide and about three inches tall, provides plenty of space for multi-touch gestures, and we had no problem with responsiveness. We did, however, notice recognition of some unwanted gestures, such as swipe-to-switch multitasking gestures introduced in Windows 8. The 2560×1440 touchscreen that comes standard on this Ultrabook provides about 220 pixels per inch, a count that’s barely short of Apple’s 13-inch Retina and roughly 80 PPI higher than a standard, 13-inch 1080p display. This results in excellent image clarity – when the source content is up to par, at least. Scaling remains an issue, as it does on all Windows notebooks that exceed 200 PPI, but Toshiba tackles the problem with a suite of tools called Display Utility which includes a video scaler and custom DPI settings. The end result is an improved user experience with less blur and larger icons. 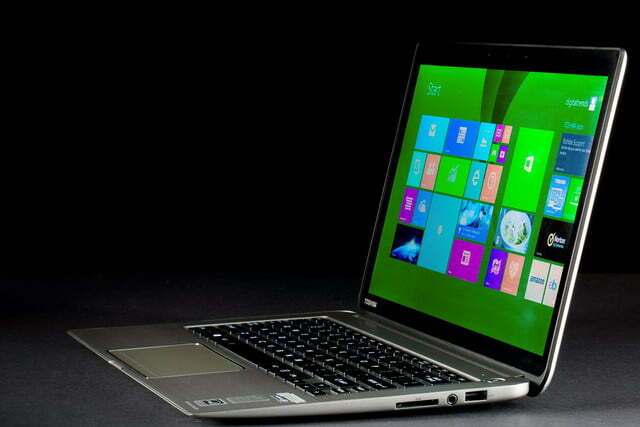 Toshiba’s Kirabook can’t beat its PC competition, nevermind the MacBook Pro. Image quality is strong, but a bit below average. Our tests revealed that the Kirabook’s panel can display 95 percent of the sRGB gamut and reach a contrast ratio of 590:1 while maintaining deep blacks. The Acer Travelmate P645, however, has a contrast ratio of 620:1, and the HP Spectre 13t reached 650:1 while rendering 97 percent of sRGB. Only the ASUS Zenbook UX301LA, which suffered from a contrast ratio of only 320:1, is significantly worse. There are problems, however. One is brightness, as the panel reaches only 188 lux at maximum. Only the Lenovo ThinkPad X1 Carbon and HP Spectre 13t score lower. We were also surprised to see the Kirabook display a vertical viewing angle so narrow that even the slightest degree of tilt away from an optimal viewing position noticeably degrades color accuracy. Despite its slim frame, the Toshiba Kirabook provides reasonable sound quality within limits. Maximum volume is not loud by any standard, but clarity is reasonable and bass doesn’t completely trash the mid-range. 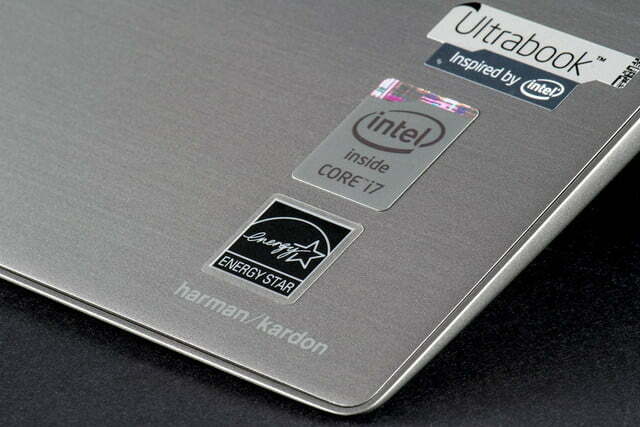 While the basic Kirabook ships with a Core i5-4200U CPU, our upgraded review unit came packing a Core i7-4500U. This impressive processor led the system to surprisingly mundane results, however, as we recorded a SiSoft Sandra Processor Arithmetic score of 40.3 GOPs and a 7-Zip combined compression score of 7,403 MIPS, both of which are average numbers. The Lenovo T440s scored 7,277 and the HP 820 scored 7,062, but the ASUS UX301LA, equipped with a Core i7-4558U, scored 9,806. The solid state drive also returned a respectable score of 4,978 in PCMark 8’s storage benchmark. This is strong, but it doesn’t differ from most other SSD-equipped systems. The Lenovo ThinkPad X1 Carbon, HP Spectre 13t x2, Lenovo ThinkPad X420, and Lenovo ThinkPad T440s have all scored 4,900 or above, and this list consists only of systems we’ve reviewed over the last two months. Gaming performance tells the same story. 3DMark turned in a Cloud Gate score of 4,199 and a Fire Strike score of 602, respectable numbers that beat alternatives like the Lenovo ThinkPad T440s and HP 820 but fall short of the ASUS UX301LA and Lenovo ThinkPad X1. And then, of course, there’s the MacBook Pro 13, which has a far more powerful Intel HD 5100 integrated graphics chip. We tested real-world gaming with League of Legends, which ran at an average of 33 frames per second with detail set to medium and the resolution set to the Kirabook’s native 2560×1440. The maximum FPS at this setting was 44, but the minimum was 18, indicating gameplay could be choppy at times. Bumping up detail to Very High was too much for the notebook to handle, resulting in an average of 20 FPS with a minimum of 12 and a maximum of 27. Still, these numbers show that this Ultrabook can handle older 3D titles even at its demanding native resolution. The Kirabook, at 2.97 pounds, is one of the lightest Ultrabooks on the market; most competitors are around 3.5 pounds. 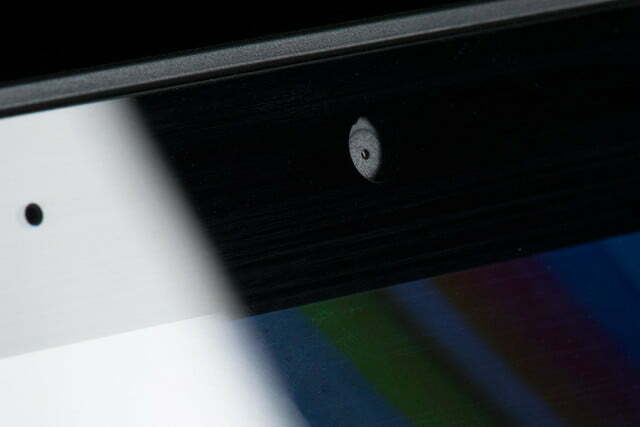 The display’s thin bezels lead to tight dimensions, too, which makes the system remarkably easy to carry or pack. Even the power brick is tiny. 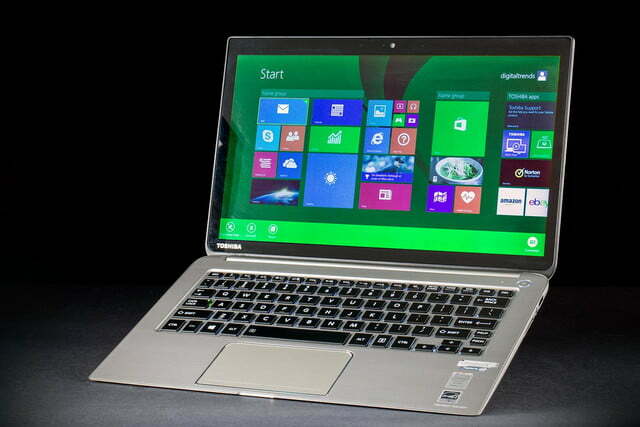 The new revision of Toshiba’s Kirabook is in every way a better laptop than its predecessor. Unfortunately, the battery doesn’t live up to expectations. It lasted four hours and twenty-six minutes when we ran the Peacekeeper web browsing benchmark. That’s low for a system of this size; the HP 820 offers five hours and forty-three minutes, the HP Spectre 13t lasted six hours and six minutes, and the Acer Travelmate P645 almost doubles the Kirabook’s endurance by lasting eight hours and two minutes. 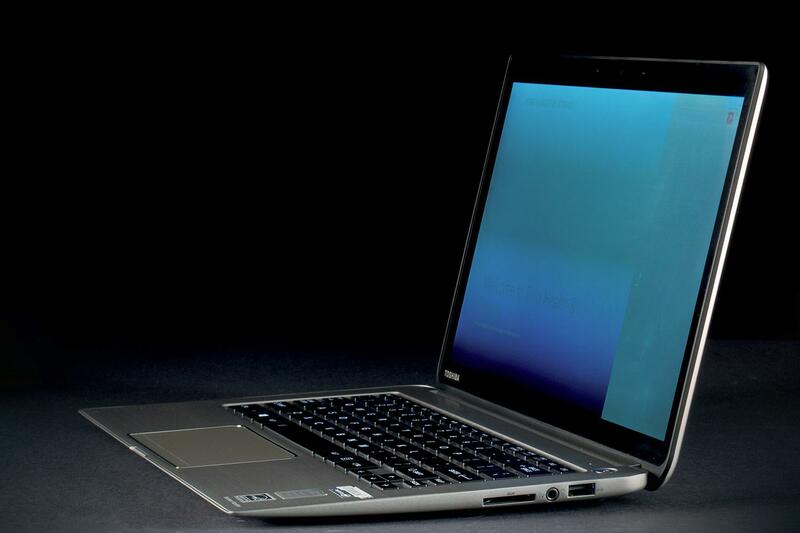 Real-world endurance can be extended by using Toshiba’s “eco” mode, which drastically cuts back display brightness and enables some very aggressive power-saving settings. This makes the notebook frustrating to use, however, and isn’t practical for most situations. Our wattmeter told us that the Kirabook draws about 10 watts of juice at idle with the display at maximum, and up to 29 watts at full load. These results are about average; the HP Spectre 13t drew only 7 watts at idle, but the ASUS Zenbook UX301LA required 11. At load, the former required 28 watts, while the latter needed 37 watts. Heat and noise were two serious flaws in the original Kirabook, and while updating to a 4th-gen Intel Core processor has alleviated the issue somewhat, it hasn’t been entirely resolved. At idle, the system’s maximum external temperature hovered at a modest 72.1 degrees Fahrenheit, but heavy load turned the heat up to 104.8 degrees. Only a few recently tested systems, such as the HP Spectre 13t and Dell XPS 15 (which sports a quad-core processor) run warmer. Noise is the same story. There’s no problem at idle, as the fan is audible but emits a soft sound. Turn up the heat, however, and the fan generates an irritating 46.1 decibels. 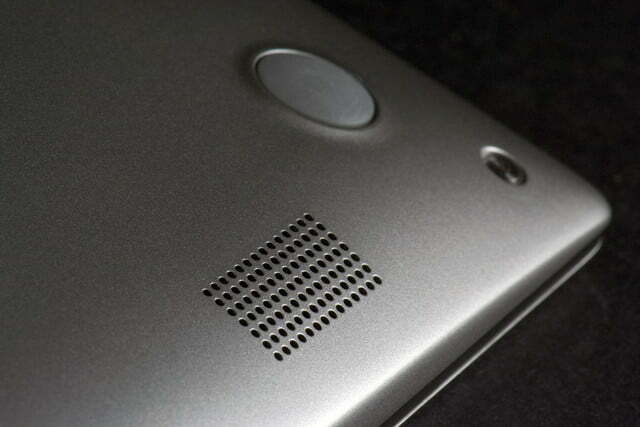 Again, only the HP Spectre 13t, which produced 45.2dB, is close. 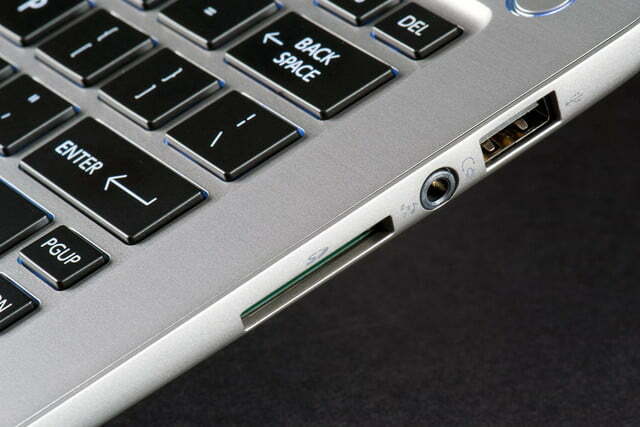 Most 13-inch Ultrabooks produce between 41 and 44 dB at load. Our review unit arrived with minimal bloatware. No extra icons adorned the desktop and the Start Screen featured just a few extras, like Netflix, Amazon and eBay. Norton Internet Security came installed, however, and begged us twice to register the software. 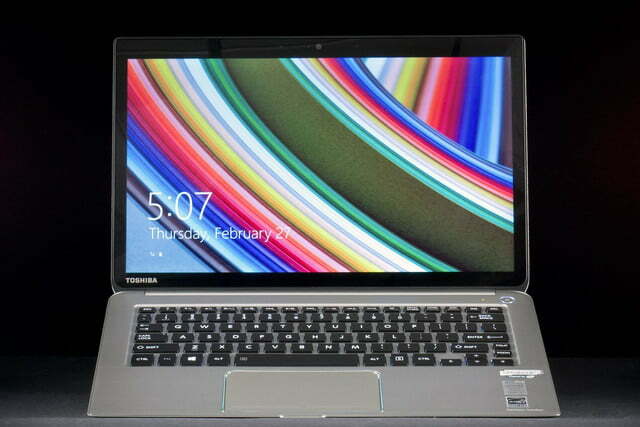 The new revision of Toshiba’s Kirabook is in every way a better laptop than its predecessor, but the competition has also improved and high-resolution displays have become more common, detracting from the system’s main selling point. Indeed, we think this new model is rather late to the party. 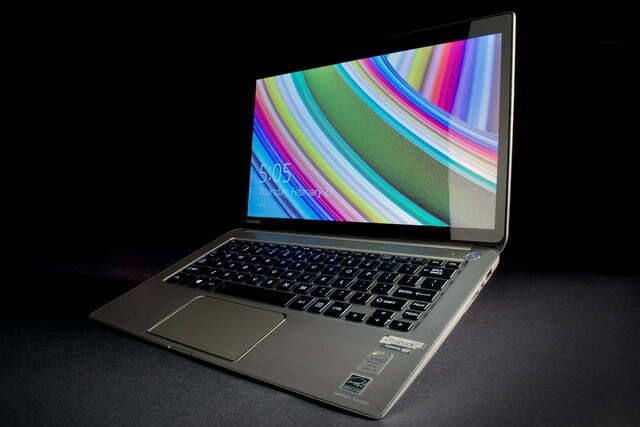 Ultrabooks running 4th-gen Intel processors have been out for about six months. Matters are made worse by Toshiba’s decision to leave the system’s flaws unaddressed. The keyboard is still smaller and more awkward than it needs to be, heat and noise remain elevated, and the overall aesthetic is lackluster for an Ultrabook that starts at $1,499. Many competitors, including the Apple MacBook Pro, Dell XPS 12 and even the Lenovo ThinkPad X1 Carbon, offer similar or better hardware for less. For all that has changed, our verdict on the Kirabook is the same; it’s an alright Ultrabook that demands an ultra-premium price. While it’d be a stretch to call this system bad, it’s certainly not a good value. 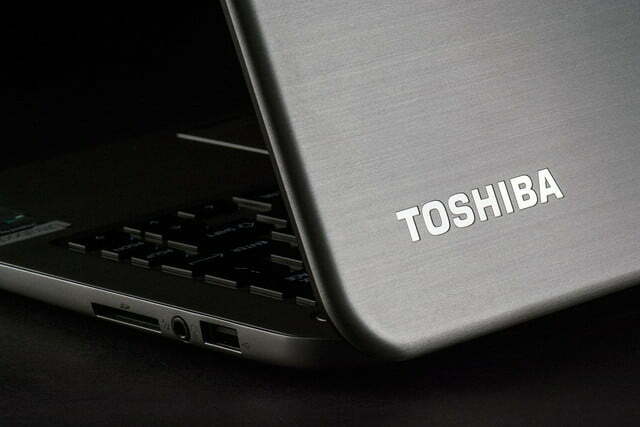 Toshiba still has work to do if it wishes to attract consumers with more than a grand to spend.